This recipe goes out to my mother-in-law. We were over visiting the other weekend and after a decent sleep-in on a Saturday morning, I woke up to find that she had made pancakes for breakfast. I know that pancakes aren't exactly a baked good or a dessert, but it's a semi-sweet item that involves making a batter so I'm going to go ahead and say it's a bit daunting for a non-baker. Anyway, in search of the best pancake recipe ever, she went online and googled "best pancake recipe". I mean, who wouldn't right? Ha. The problem is, everyone and their grandma thinks they have the greatest pancake recipe ever. Go ahead and google it - there are a billion and a half "best" recipes of everything and anything, from "the world's best pancake recipe" to "really the best pancake ever recipe". Overall, they were rough. She knew something went wrong. They were super thick, kinda dry and really tough...like a bread. It wasn't here fault though. The recipe called for almost twice as much flour as a pancake should have....and only a teaspoon of butter. Come on!! The liquid to dry ratio was way off. She even went to the extra trouble of beating the egg white separate from the yolk and folded it into the batter. I mean....that's impressive for a non-baker. 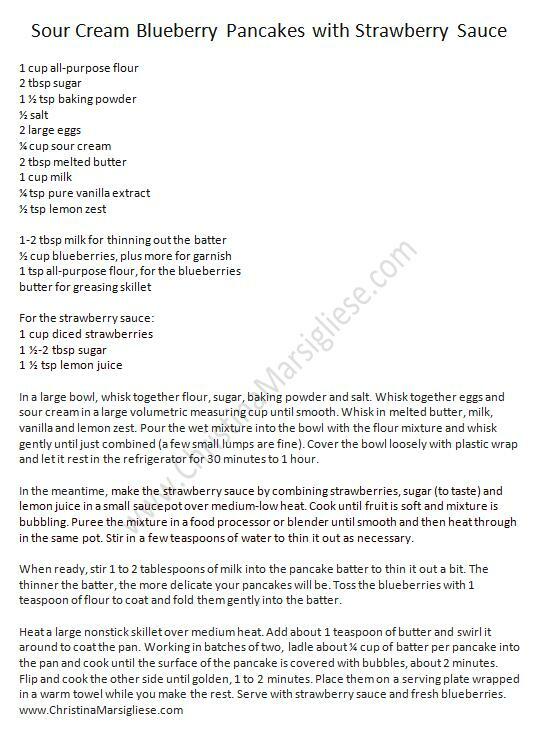 So to make her life easy, here is my favourite pancake recipe. And yes, these are the best Sour Cream Blueberry Pancakes I've ever had. Soft, moist and still a bit of bounce to them - no need to whip up any egg whites with these bad boys. 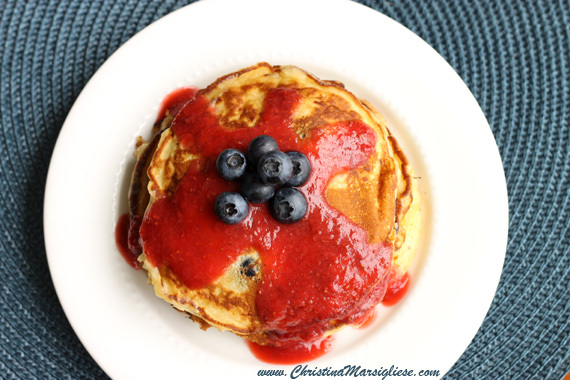 The key to a light and delicate pancake is to avoid stirring or whisking more than necessary (a few small lumps in the batter is OK), using the right amount of baking powder and the right ratio of liquid to dry ingredients. 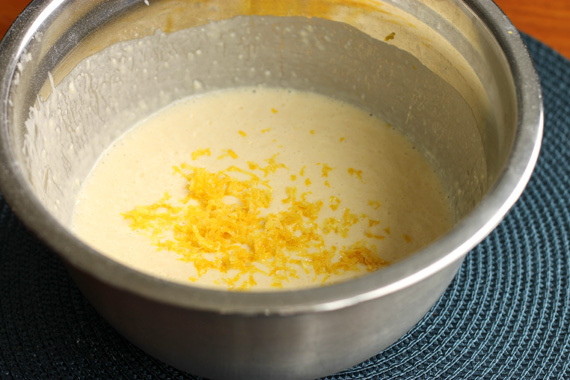 A pancake batter should be rather wet or thin and it will thicken as it sits in the fridge for a bit. Also, sour cream keeps them tender and makes them taste freakin' delicious. Blueberry and lemon is a killer combo. So I grated some fresh lemon zest right into the batter and folded in some blueberries right before cooking them up. 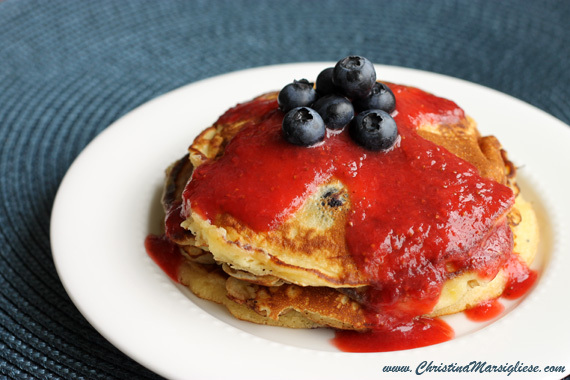 (Here's a trick - toss the blueberries in a teaspoon of flour before adding them to the batter. This will help to keep them suspended so they don't sink to the bottom). Then I smothered them in fresh strawberry sauce. So good and totally dessert-worthy even though it's for breakfast. Mom? Did you use a box mix!? Gross. These look incredible. I love adding sour cream to baked goods, it adds a creamier consistency! Wow these pancakes look amazing!!! Your strawberry sauce looks so good. Most of the time they are runny and full of sugar but yours looks thick and decadent! Looks sooo yummy with that sauce! This sounds absolutely fabulous. I have to try this one! Can you make the batter the day before or will that ruin it? I wouldn't leave it for more than 2 hours. Too much gluten can develop over time and may make them tough.